BuilderElements.com announces the launch of a new arrival mosaic tile, MAG0028. It is the latest addition to our popular metal glass tile collection and features itself brown, khaki and silver mixed color and interlocking pattern. Its contemporary color blend is designed to make itself chic. Moreover, its clean geometric design with metal and glass is visually striking. 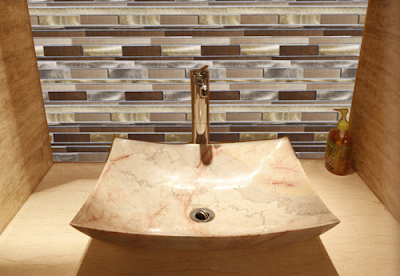 This tile will provide any room with stylish,elegant and contemporary appearances. It will be a great choice to use for in a kitchen back splash, featured wall, decorative border and much more spaces in your house. MAG0028 is with 12 x 12 inches overall size and 0.16 inches thickness. 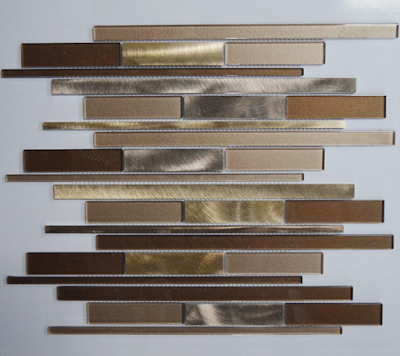 It is mesh mounted mosaic tile. 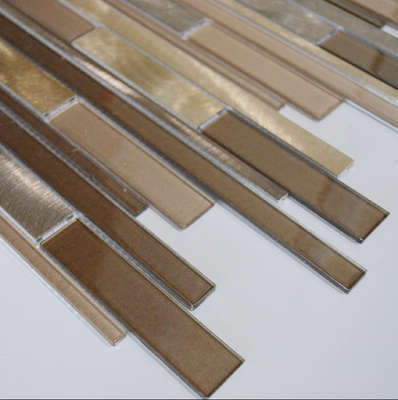 Whether for kitchen backsplashes, vanity backsplashes, accent walls, bathrooms, living rooms and any other space, this tile is durable and stunning and can be installed on not only interior residential but commercial wall areas. MAG0028 is with 12 x 12 inches overall size and 0.16 inches thickness. It is mesh-mounted mosaic tile.Whether for kitchen backsplashes,vanity backsplashes,accent walls,bathrooms,living rooms and any other space,this tile is durable and stunning and can be installed on not only interior residential but commercial wall areas.